The names for welding techniques are pretty straightforward…stick welding uses a stick electrode, flux core welding requires a flux core, etc. From a practical naming standpoint Submerged Arc Welding (SAW) is no different. In Submerged Arc Welding, the arc zone is fully submerged beneath a heavy layer of flux material. The process protects the weld from any chance of atmospheric contaminants and eliminates the need for shielding gases. Some welding projects require very high quality welds. If that’s the case Submerged Arc Welding (SAW) is what you need. This welding process is commonly used on steel and steel and nickel alloys as well as surfacing applications. It is the preferred welding method for joining plate metal because it creates such strong welds. The strength of the welds is due to the process itself. SAW uses a continuously fed wire electrode and the weld metal to create the weld pool. Flux is poured directly into the weld pool where it becomes molten and conductive and acts as its own shield protecting the weld site from contamination and the operator from spatter, sparks, UV rays, and fumes. Excess flux gets recycled back into the hopper where it can be reused. SAW is usually a fully automatic process, but it can also be semi-automatic. Since operators can’t see the weld and make adjustments, they must rely on machinery and parameter settings to manage bead shape, depth of penetration, and chemical composition of the weld metal. SAW has both advantages and limitations. It is not suitable for every welding application, but can be extremely effective in certain situations. 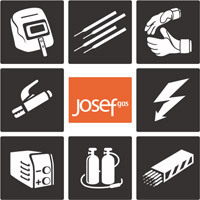 Josef Gas carries a full line of welding supplies and materials. Visit us online or in person at 201 Basaltic Road in Concord, Ontario for all of your Submerged Arc Welding needs! Shop for machinery, electrodes, and more!